Episode 2 is finally live! To participate in Week 2 of the Daredevil Special Event, you need to download version 1.3.2 for iOS or version 1.3.3 for Android. Firstly here's the FAQ from TinyCo. How do I recruit Hellcat? 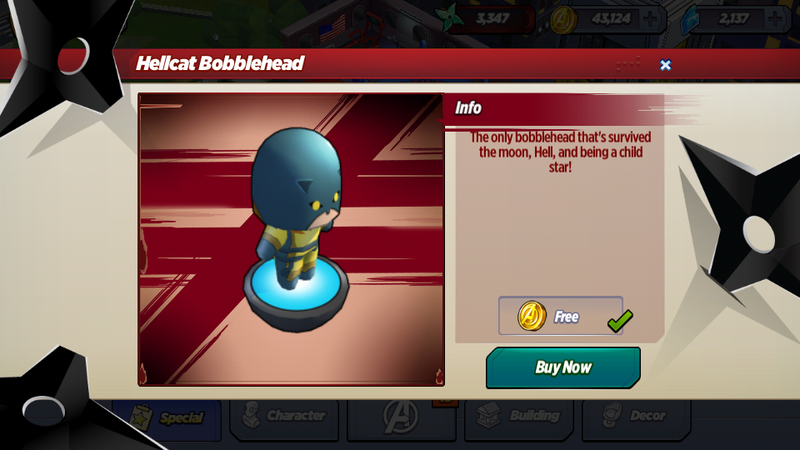 Once you reach the quest ""Heck Yeah!,"" you will be able to recruit Hellcat. She must be completely unlocked by the end of the event or she will disappear from the game at that time. How do I unlock Elektra? You can get Elektra from the Mystical Ninja Crate, available from the shop for 75 shards. As an Advanced Toxic trait character, she does bonus damage to Toxic and Quick Ninjas. She also heals two times faster than other heroes. How do I unlock Armored Daredevil? Defeat the Ninja Boss 10 times before September 6th, 6 pm EDT to unlock Armored Daredevil! Armored Daredevil does bonus damage to both Speed and Strength Ninjas. How do I defeat the Ninja Boss? The Ninja Boss will appear after you have recruited Daredevil. He is a challenging opponent, and all of your Heroes will deal reduced damage to him. Power Attacks are strongly recommended. As you may have gathered from Elektra's info above, there is a new Mystical Ninja Crate in the shop which will cost you 75 Shards a try. See here for more info. Daredevil: We should train at Fogwell's Gym. It'll be the best way to get stronger for whatever Kingpin and the Hand send at us next. Jessica Jones: Isn't that where your dad used to fight? Daredevil: Weren't you the one who taught me the first rule of Hell's Kitchen? Jessica Jones: Don't bring up old stuff. Daredevil: It's a good rule. Jessica Jones: You' think I'd remember since it's the only rule I like. Raise Daredevil's Attack Skill to Level 2! Jessica Jones: Where'd you learn how to fight like that? Jessica Jones: I don't know what's wrong with me today. Let's punch ninjas. Punisher: I usually deal with bullies and mobsters. They don't like to talk either. But they sure do like to scream when I start snapping their fingers. Punisher: Best thing about you not talking is you won't tell Kingpin that he's on my list too. Defeat a Level 4 Ninja! Kingpin: Did you talk to the ninjas? Punisher: You gonna act like you weren't watching me the whole time? Punisher: I talked to 'em from a foot away. What do you think? Kingpin: I think I don't appreciate your tone. Punisher: I'll smother it in gravy next time. Jessica Jones: We can use Alias Investigations to decipher the Scrolls that the ninjas are trafficking. Daredevil: Should we bring in Loki since it probably involves magic? Jessica Jones: I kind of like him, but I'm not letting him touch my stuff. Jessica Jones: The common theme with all of these is death. Do you really think they're trying to resurrect someone? Jessica Jones: And why would Kingpin be helping them? Daredevil: Why are you working with the Hand? Kingpin: I have no idea what you're talking about. Daredevil: We're gonna find out what's in those scrolls. If not, I'll beat it out of you. Daredevil: Why are you working with Kingpin? Punisher: Get out of my face before I break yours. Daredevil: If you're waiting to turn on him, don't wait too long. Anyone standing next to him is going down with him. Punisher: Talk to me when you're ready to swing. 'Til then, shut your mouth. Loki: Are you prepared to watch your lawyer dreams crash and burn? Daredevil: I'd rather be training to fight the Hand. Also, I can't see, so I won't be watching anything. We've been over this. Loki: You seem more confident in your ability to win this trial. Are you hiding something? Daredevil: No, I just feel good about the fact that you have no idea what you're doing. Raise Daredevil's Attack Skill to Level 3! Loki: That's what I call godly lawyering. Daredevil: You just pranced around yelling "Guilty!" Kingpin: Your subordinates are failing horribly, but your masters assure me that a Hand Ninja Boss is indestructible. Hand Ninja Boss: Show me the one called Daredevil. Kingpin: And you actually speak?! If I would've known, I would've ordered more Bosses from the beginning. Hand Ninja Boss: I only take orders from the Demon Lord, you mountain of mashed potatoes. Kingpin: How did you know Loki called me that?! Hand Ninja Boss: It's a meme now. Kingpin: Apparently we have different definitions of indestructible. Hand Ninja Boss: I'm testing their skills before using my special attacks. Go back to eating your mashed potatoes. Kingpin: He didn't say I ate mashed potatoes, you idiot. He said I looked like mashed potatoes. Hand Ninja Boss: I'm assuming you also eat them. Kingpin: And I've seen the memes. A pile of mashed potatoes wearing my coat. A stick of butter melting on my forehead. It's juvenile and absurd. Hand Ninja Boss: My favorite is the one where you're standing in a snowstorm, but the snow is chives. Daredevil: I'd like to remind the court that Director Fury did not invite the attacks by A.I.M., Hydra, and the Chitauri. 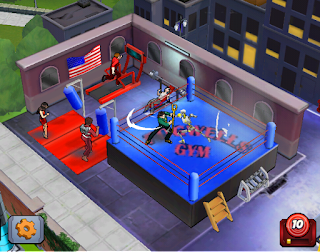 Daredevil: In fact, Avengers Academy is the only reason those groups haven't already conquered our planet. Daredevil: You can't scream "Objection!" after everything I say. It doesn't even make sense. Daredevil: I always hoped my first trial would go as horribly as possible. Nick Fury: Don't worry about it. You're doing great. Daredevil: I've barely been able to get a word out. Polls say that Loki literally convinced everyone that there's an evil monster hiding under your eyepatch who's secretly running Avengers Academy. Nick Fury: No one can say he doesn't have a good imagination. Daredevil: Don't worry, Iron Fist. We're gonna get you out of there. Iron Fist: No worries, Matty. I'm chillin'. Every once in a while I hit my hand on the glass, but that's just because I have this smooth beat going on in my head, you know? Daredevil: It would be easier if I wasn't being attacked by ninjas. Iron Fist: The calmest region of a storm is at its center. Center yourself, and you'll find your calm. Daredevil: Did you learn that from your master in K'un-Lun? Iron Fist: From the inside of a bottlecap, man. Knowledge is all around us. Daredevil: Thanks. I feel better. Sometimes I get away from my meditation. Iron Fist: I'm trying this thing that's like a hundred percent meditation a hundred percent of the time. Like the world is just flowing around me, and can't touch my calm. Literal permanent chill. Iron Fist: But I got these powers and this super chill tat by hugging that dragon. That's the power of positivity, man. Hellcat: Quickly, to the Hellcatmobile! Hellcat: My super-car! I hardly ever break it out, but this epic situation is definitely begging for it! Jessica Jones: Why have I never heard of this? Hellcat: I let She-Hulk borrow it a couple years ago, and she smashed it over some guy's head. It's fixed now. Jessica Jones: Does it have claws that pop out or something? Jessica Jones: I'm not gonna lie, it's a pretty sweet car. Jessica Jones: Can I borrow it? Jessica Jones: I don't blame you. Hellcat: I'm gonna take my car into the city, and pick up Mr. Mysticat! Jessica Jones: I refuse to comment on this. Hellcat: But he's such a good kitty! Once he's here, I'll feel all the way at home! Jessica Jones: All I brought was my camera, and some brass knuckles. Jessica Jones: ...Madame Knockout Punchlips. Iron Man: I'm making you some armor. You keep going up against ninjas in your dress clothes and stylish pantsuit, and sooner or later you're gonna get hurt. Daredevil: First of all, I'm not Daredevil, so I have no idea what you're talking about. Second, I've never let injuries stop me before. Iron Man: Wearing armor doesn't make you any less tough. If anything, it just makes you more handsome and dynamic. At least, that's what it did for me. Elektra: Are you surprised I'm here, or just surprised I snuck up on you without you noticing? Elektra: Powerful? Deadly? The most interesting and exciting woman you've ever met? Daredevil: What are you doing at Avengers Academy? You will need to invite her from the shop menu after winning her. Pepper Potts: Welcome to Avengers Academy, Elektra! We're so happy to have you here! Elektra: Thank you. You should know that I have no intention of attending class, I will come and go as I please, and I will most likely maim many people. What do you think of Episode 2 so far? Excited for Hellcat? Like Falcon's new costume? Enjoying the event overall?